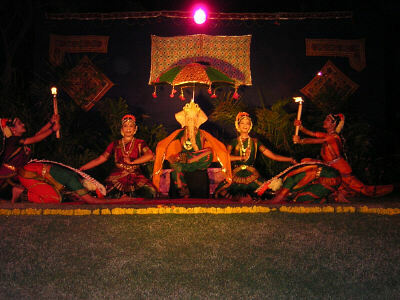 Sadhana panchakam of Sri Shankaracharya says ‘Sangh satsu vidhiyatam bhagvato bhaktir dridha dhiyatam’. "Let him resort to satsanga (company of the wise) and let him have unswerving and firm devotion to God". One of the most helpful instructions for a spiritual aspirant is said to be in contact with the wise- the stotriya Brahmanishthas- those who are well versed in the scriptures and always fixed in Brahmic consciousness. Sat means Existence-Absolute, which is also Consciousness-Absolute and Bliss-Absolute. Satsang- therefore, word means keeping the mind always in one’s own Atman. It also means the company of the learned saints and sages because their company would always be conducive to keep the mind away from worldly thoughts and absorbed in thoughts of God. Bhakti is a natural consequence that follows satsang. Company of great Saints will kindle the fire of devotion to God, as the omniscient, omnipotent and omnipresent Being, the instrumental and material cause of creation, preservation and destruction of the universe. The aspirant should have shradhha - unflinching faith in God- so that this ego may get thinned out. To everything including success in his spiritual practice, he now depends on God and God alone. The Acharya in his Vivekachudamani defines Bhakti as seeking after one’s real nature (sva-svarupa anusasdhanam) and Sri Sandilya in his Bhakti Sutras defines this world as extreme attachment to Ishwara, the Lord. On a little reflection one understands that there is not much difference between the two definitions. To realize this very truth we had two Saints to grace us, to uplift us and to elevate us up to the highest spiritual realm of the absolute at Sivananda Ashram, Ahmedabad in the holy month of Shravan- August 2003. Sri Vairagibabaji of Brindavan stayed with us from August 5, 2003 to August 16, 2003. Everyday we had two public and one private satsang and kirtan’s spiritual feast. Devotees flocked from all corners of Gujarat . He sang, He danced and poured His heart in all his divine ecstasy. H.H. Sri Swami Chidanandaji Maharaj, a very learned and scholarly exponent and eloquent speaker of Vedanta Vidya of Varanasi (Formerly affiliated with Chinmaya Mission) reached Sivananda Asharam on August 26, 2003 . A Satsang with specially for women was organized from forenoon to late afternoon. Rev. Swamiji Maharaj expounded the meaning of " Sthita Pragya" upon the request of devotees. He stayed up to August 28, 2003. During all three days His Holy presence was simply soul elevating for the ashram inmates. On August 15, 2003 National Flag was hoisted in the ashram campus. Rev Sri Swami Adhyatmanandaji inaugurated patriotic song competition for school children and gave inspiring speech to the gathering and said that love your Nation. Nation first, society next and self the last or least. Swamiji’s interview on present mode of education, need of the teaching of religion, morality, ethics, moral duty of parents, teachers, spiritual heads, citizens and politicians etc was telecasted on the eve of Independence Day. Holy Shravan was celebrated with a special worships (Pujas), Bilva Patra offering (in millions) to Lord Shiva at Sri Vishvanath Temple. Also Vishnu Shashranama chanting & discourses by Swamiji on its Glory were enjoyed by devotees. 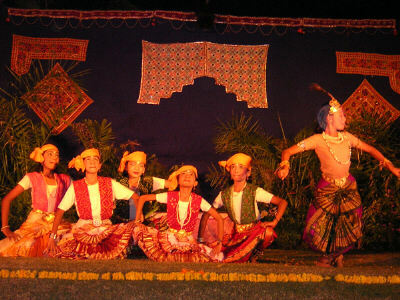 Holy Sri Krishna Janmashtami was celebrated with satsang, sankirtan, dance festival and at midnight Baby Krishna's Janmotsav on the night of Wednesday, August 20, 2003. About 25000 devotees had the holy darshan of Lord Vishwanath, Sri Dukhbhanjan Hanumanji, Mother Ashta Laxmi as well as “Baby Krishna”. Sri Chandan Thakore (Director, Nritya Bharati- a school of performing arts) with his amateur artists presented a very memorable performance, which received a grand applause from a large audience. On the last day Amavasya of Shravan on August 27, 2003, Laghu Rudra and Bhandara were organized and about 1000 devotees joined for the holy prasad. 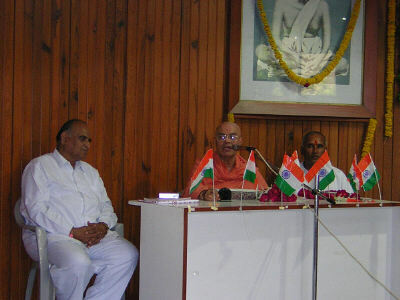 Sri Swami Adhyatmanandaji's speech on the subject of Attaining MBA, Mind - Body - Awareness at Ahmedabad Management Association (AMA) week, on August 26, 2003 was very well received by the audience. On August 31, 2003 the Holy Ganesh Chaturthi satsang has been organized at the residence of Secretary of Ashram Shri R.K.Sonar in the presence of H.H. 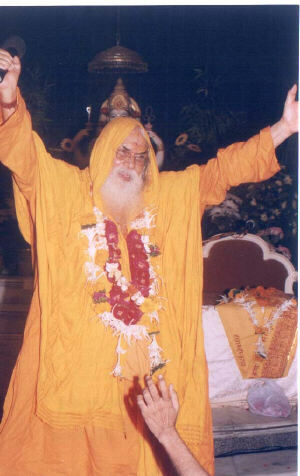 Sri Swami Adhyatmanandaji Maharaj. A three-day residential spiritual retreat is being organized at the bank of Saraswati at Kapilmuniji’s ashram, Siddhapur. Rev Swamiji will share the sayings from Sadhana Panchakam of Sri Shankaracharya. A select group of 60 Sadhaks are planning to attend the retreat where, ten hours of intense meditation, prayers and introspection is scheduled daily. 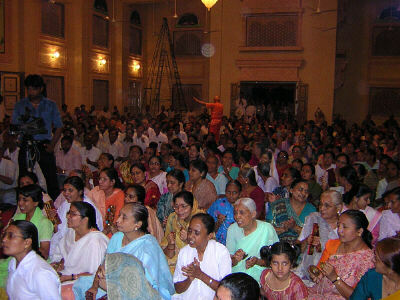 On August 4, 2003 satsang was held at the residence of Shri Kanubhai Soni and Smt Veenaben Soni. Sri Nathalalbhai (96 years) late father of Sri Jagdishbhai Patel (vice-president, Divya Jivan Sanskrutik Sangh) breathed last on August 6, 2003 . On Saturday August 9, 2003 a prayer was held for the peace of the departed at his residence. Rev Sri Swami Adhyatmanandaji led the prayer. On August 19, 2003 Smt Anjaliben Upadhayaya’s group at Sri Sri Ashatlakshmi Bhavan presented devotional Marathi Abhang from 3:30 pm. to 5:30 pm. Mr. B. K. Goswami I.A.S. (retired) and now a trustee of Consumer Education and Research Center (CERC), New Delhi , visited ashram on morning of August 24, 2003 and he expressed joy meeting Rev. Sri Swami Adhyatmanandaji Maharaj after over a decade. Seminar on reiki, yoga classes, sewing classes, medical care, sure cure through yoga, feeding to poor, domestic help and daily & weekly special satsangs are the core activities of the Ashram that have been benefiting the community. Sept 1 - Sept 7, 2003 A special Yoga & Meditation camp at the bank of holy River Narmada at Ankaleshwar with AVENTIS Pharma Ltd. for Scientists only. Sept 8, 2003 116th holy birthday of H.H. Sri Gurudev Swami Sivanandaji Maharaj. One Day Long Sadhana Day at Sivananda Ashram, Ahmedabad. Sept 9, 2003 Rev Sri Swami Adhyatmanandaji's public discourses on the occasion of 5th anniversary of NR Institute of Buisness management on the subject of : "Eternal Unchanging Values of the Yore and Present Constitution of Education"
Sept 24, 2003 Holy birthday satsang of H.H Guru Bhagavan Sri Swami Chidanandaji Maharaj 6:00 a.m. to 8:00 p.m.
Centenary birthday Celebration of Sri Sri Sri Krishnabai Mataji of Anand Ashram will be celebrated with Ram Dhun and Gathering of Great Saints. Yoga Teachers Residential Training Camp (prequalification & prior registration required). International students are welcome too.